Looking after your skin is important and after all the stuff I’ve gone through with mine – how it’s reacted, been treated, tried to recover etc etc – then a little extra step to make it feel good makes sense. But as I said, what even are essences? I briefly said this in my Korean Beauty haul; no one really knows what it does, but you need it. It’s like that extra bit of oomph between your toner and serum, the consistency of a thicker toner but much more fluid that serum, easily penetrating the skin and just making it incredibly soft and smooth. Firstly Kiehl’s, the original essence product I got my hands on (because imports from Korea take a loooong time) and obviously the most accessible to us as it’s available at Liberty, Selfridges, all the stores we can shop easily. The Iris Extract Activating Treatment Essence is seriously hydrating, you can feel the product is the perfect balance of watery serum and hydration boosting properties that we need to reach deep down into the skin and actually absorb, yet it never drinks up too much nor leaves a lot on the surface thanks to the addition of LHA to active the natural exfoliation of our skin – just that perfect balance needed. One quibble now that I’ve tried both is that the product comes out a lot easier in this bottle, ideally you need 3-6 drops depending on thirst and the size of your face, and this product can dispense quite easily if you’re not careful; also the Iris essence does contain alcohol which you can smell on application, and compared to Missha which is alcohol-free it does take it down a few points for being potentially stripping on certain skin types. 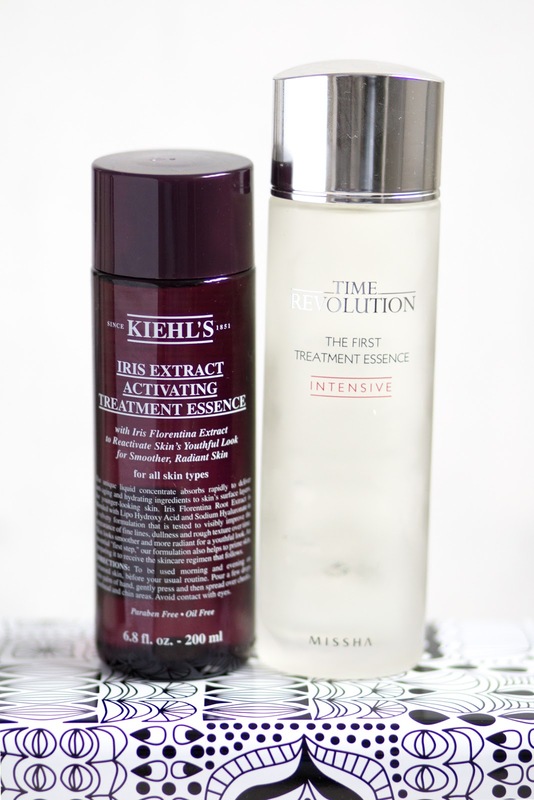 One of the most famous essences and perhaps the leader in it’s Western exposure is the Missha Time Revolution Essence, which is one of the most popular essences available in Korea (and about half the price of it’s competitor SK II). I was so excited to get my hands on this and honestly, I adore it. From the reviews I read prior to trying this, lots of people rated the plump texture to their skin, the thin yet absorbent consistency, and also the fact it’s made by a cruelty free brand, and to be honest I have to agree with everything they’ve said – the hydration is just enough in the morning, adding a plumped appearance and despite containing a yeast extract, it smells pleasant and is gentle on the skin thanks to the lack of alcohol in the formulation! Personally, I’ve found it to brighten and add plumpness to my skin, and it’s a much lighter option to Kiehl’s especially in the morning and would happily use it all year round – well, there’s no problem with that considering the amount of product and how you have to shake it out to get a face-full of essence! So which comes out on top? On one hand Kiehl’s is a fab take on an Asian product, packed with hydration, skin protection and boosting properties to make your skin feel and look healthy and hydrated all day long, but it has small niggles such as the top dispensing more product than you may need and the addition of alcohol in the formula. For £36, you get so much for your money, and I find the thicker consistency is better for nighttime or really dehydrated days, but with Missha I just love the lightness to it and the fact it’s been formulated to naturally revive the skin. It has made my skin feel plump and bright, smooth and soft so it takes the edge over Kiehl’s as it’s the original product on the market plus the dispenser is easier to manage (and alcohol free, very important), however BOTH are worthy products in your skincare drawer, and if you haven’t been convinced to buy at least one of them yet, then you seriously need to do so now. Okay, so another step may be a faff, but patting in some serious hydration free from toxins and gentle on the skin to keep your complexion looking fab at a very reasonable price, well there’s only one clear winner here – your skin. Have you tried essences before? Will you be picking up a bottle of Kiehl’s and Missha? Do you want to see more reviews on Korean beauty?